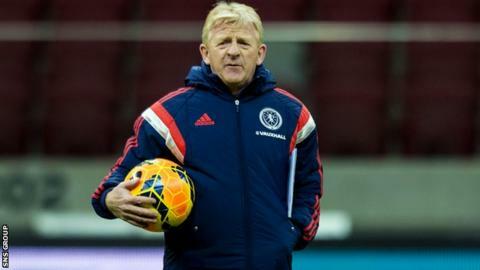 Scotland boss Gordon Strachan insisted he was not disappointed to have missed out on being named on the shortlist for the PFA Scotland manager of the year. Strachan has lifted the national side to 22nd place in the world rankings - a rise of 47 places since he took charge in January 2013. But he was not among the nominees he revealed at a PFA media conference. "I only play four or five games - I'm part-time," he joked. "These guys have got to do it week-in, week-out." The men in the running for the prize, voted for by their fellow managers, are Celtic's Neil Lennon, Aberdeen's Derek McInnes, Motherwell's Stuart McCall and St Johnstone's Tommy Wright. The quartet of nominees were all praised by Strachan, who also had words of sympathy for those struggling at the wrong end of the Premiership. "Every day is a slog for them," said Strachan, who won the award twice when in charge of Celtic. "At the moment, the boys at the bottom of the league, that's hard work for the managers, how to deal with being at the bottom of the league. "I meet some players every couple of months, we get together, have some fun, see how it goes and then get back down the road again. "To be fair, while it is physically part-time, it is full time."